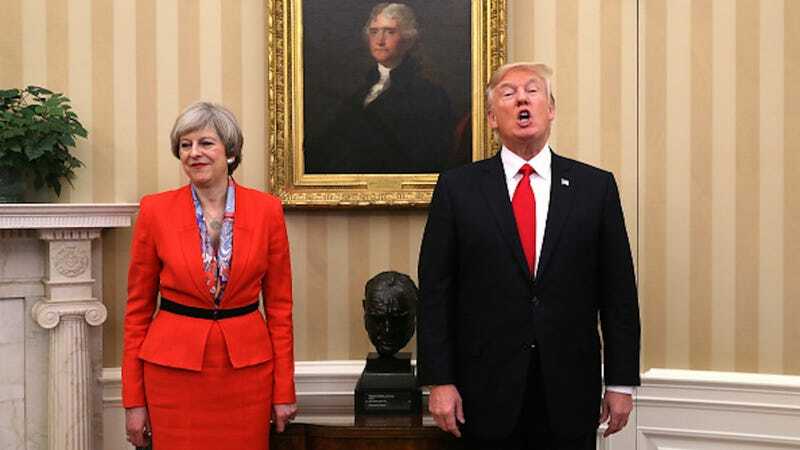 British Prime Minister Theresa May invited Donald Trump, our fluorescent ham rump-in-chief, to visit the United Kingdom just days after his inauguration. On this trip, he would meet Queen Elizabeth II (heaven help her) and, typically, he would address Parliament. But there’s a slight wrinkle in this itinerary: Parliament doesn’t want to see him. Like, at all. According to the New York Times, John Bercow, speaker of the House of Commons, has voiced his objection to an audience with Trump on the grounds of his “opposition to racism and sexism.” What’s more, 1.8 million Britons have signed a petition in favor of rescinding Trump’s invitation. However, Prime Minister Theresa May is unwilling to cancel the visit. And this makes sense: with Brexit in the works, it is advantageous for Britain to settle a trade deal with America. An official visit to London would likely grease the wheels and facilitate the business negotiations. “‘Before the imposition of the migrant ban, I would myself have been strongly opposed to an address by President Trump in Westminster Hall,’ said Mr. Bercow, referring to the oldest part of the parliamentary ﻿building in which foreign leaders have sometimes addressed both the elected House of Commons and the unelected House of Lords, the upper chamber. Bercow is not the only one to determine whether or not Trump will be granted an invitation. That said, he is one of a select few to decide whether foreign leaders will be asked to speak in Westminster or elsewhere in Parliament. “‘I feel very strongly that our opposition to racism and to sexism and our support for equality before the law and an independent judiciary are hugely important considerations in the House of Commons,’ Mr. Bercow said. George W. Bush, for instance, did not speak before Parliament when he visited Great Britain in 2003. Barack Obama did speak in Westminster Hall in 2011, and in 2015, China’s President Xi Jinping spoke in the Royal Gallery. For what it’s worth, pals across the pond, this Yankee understands why you wouldn’t want Trump on your turf. We don’t want him here either.